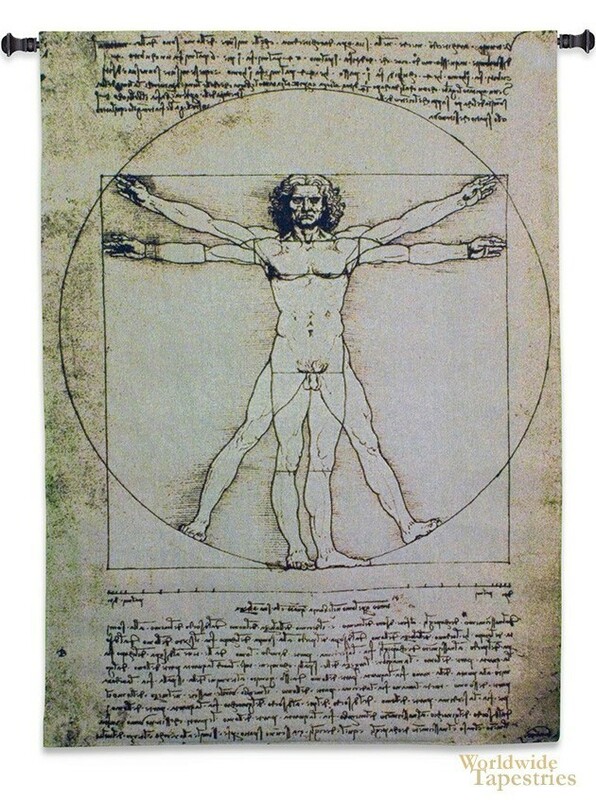 Vitruvian Man tapestry shows the famous drawing by da Vinci from 1487. This work is one of the most famous by da Vinci, and like the Mona Lisa, has taken on a life of its own. The Roman architect Vitruvious described the relationship between the human form and geometry used in architecture in the Classical period. This work of da VInci is named after this architect by tradition. This work depicts the relationship of the parts of the body to each other, including the equality of the distance between the arms and the height of a person. Texts of Vitruvian are transcribed onto this work in the accompanying text, by mirror writing. This image is often used in the medical and other scientific fields as a part of the symbolism of the work of science. It is the intense interest in both science and art, combined with pure invention that da VInci's works were on the leading edge of both art and science at the same time, a feat that is a hallmark of this master of the Italian Renaissance in Florence Italy. This tapestry "Vitruvian Man" is backed with a lining and has a tunnel for easy hanging. Note: tapestry rod and tassels, where pictured, are not included in the price.